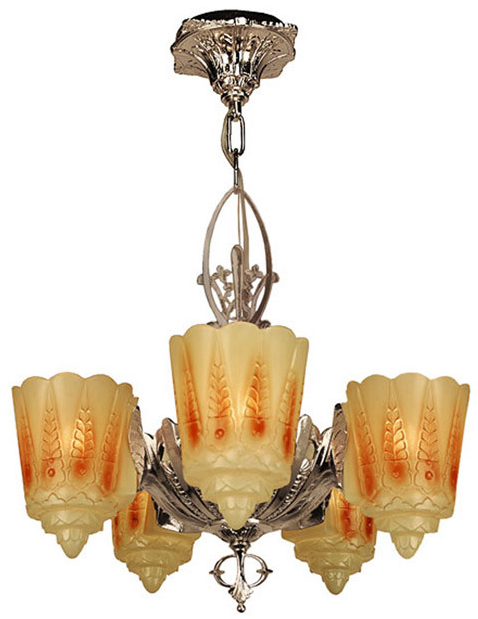 The Lincoln Series 9000 line of Art Deco light fixtures in the 1930's was called the “Two-in-One” line. While there were a couple of stem options for the 9000 Series, using this shade open end up, or open end down, gave it the "Two in One" title by Lincoln for its flexibility. The painted shades have a design over a deeply molded surface. Since the shade was made in batches, colors from each "run" could, and did, vary.Add to that the changes from age, light exposure, and repeated washings, and it’s unlikely that our quality Two in One reproduction slip shades will exactly match your antique shades. However, it might be the best available substitution in existence for antique fixtures of the 9000 Series. There is no known 6-light chandelier in this line (that is, a chandelier with a bottom shade). 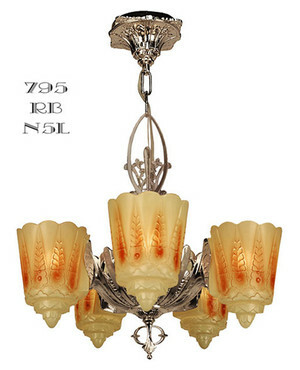 Lincoln Mfg also made a companion line called "Oriental Reversible" which used a shade with an almost identical hanging method. The five sockets can handle up to 100 watt incandescent bulb each, or purchase our optional LED bulb to maximizeyour energy savings. Makes running the chandelier all night long, perhaps as a nite lite, very economical indeed and cool to the shades as well. Our shopping cart uses a default freight amount, and you are invoiced for actual shipping charges. Don't miss the other fine reproductions in this series: the Two in One Sconce , Two in One Pendant , and the Two in One Three-Light Chandelier . Mounting canopy 5" diameter; 24 1/4" tall including finial; 16" diameter. Can be made taller with extra chain links. Up to 500 watts incandescent.